You'll be £45.00 closer to your next £10.00 credit when you purchase British Cruisers. What's this? For most of the twentieth century Britain possessed both the world's largest merchant fleet and its most extensive overseas territories. It is not surprising, therefore, that the Royal Navy always showed a particular interest in the cruiser – a multi-purpose warship needed in large numbers to defend trade routes and police the empire. Above all other types, the cruiser's competing demands of quality and quantity placed a heavy burden on designers, and for most of the inter-war years Britain sought to square this circle through international treaties restricting both size and numbers. In the process she virtually invented the heavy cruiser and inspired the large 6in-armed cruiser, neither of which, ironically, served her best interests. For the first time this book seeks to comprehend the full policy background, from which a different and entirely original picture emerges of British cruiser development. After the war the cruiser's role was reconsidered and the final chapters of the book cover modernisations, the plans for missile-armed ships and the convoluted process that turned the 'through-deck cruiser' into the Invincible class light carriers. With detailed appendices of ship data, and illustrated in depth with photos and A D Baker's specially commissioned plans, British Cruisers truly matches the lofty standards set by Friedman's previous books on British destroyers. Wow! Another book from this author and publisher with the 'wow' factor. Lavishly illustrated with a photograph or line plan on almost every page. The text is packed with technical information, detail, and description of design, construction and application of these important ships. I read it cover to cover finding many nuggets of information on the way. e.g. One particular cruiser fresh out of dock had a range of 12,000nm; the same ship after eight months cruising was 'deep and dirty' had a range of only 8,000nm. This book is a must for every Royal Navy enthusiast and would be of interest to the general reader. This is the kind of reference book where you find what you are looking for and are then temped to go on reading. Highly recommended. In most subjects there is a single book which comes to be regarded as the standard reading material. In my opinion for the RN WW2 Cruiser this book is it. It is of a uniformly high standard which is matched by the production values. The photos and plans are excellent, it is well written, contains a great depth of information and it is interesting to read... If you are interested in the subject, this is the book you should buy, I recommend you don't miss it. British Cruisers is a pleasant book with significant illustrations. It presents amazingly detailed information on the design and construction of each class of vessels. The author identifies how the need for cruisers sprang from the protection of British trade across its large empire and even larger spheres of economic and political influence. There is a wealth of information on how the naval treaties of the 1920s and 1930s were a constraint to design. There is a detailed account of early attempts to integrate aviation in the form of a catapult for a fixed wing float-plane or seaplane. This was abandoned in the 1940s and replaced during the 1950s with one or more rotating wing or STOL/VTOL aircraft. In the last section, nuclear weapons and missile delivery systems emerge to threaten the cruiser's survival. Because the major British shipbuilder, Vickers, had a yard in Spain and major shipbuilders competed for contracts worldwide, Friedman also opens a window on international naval history. The author uses a close integration of text, photographs and drawings to transmit masses of technical and visual information. The layouts introducing each chapter are stunning, high resolution two-page spreads. For readers used to deciphering censored images, they are a revelation. There are also additional half-page plans, which are finely detailed. This latest work from Norman Freidman is in many respects a sequel to the same author’s two books on British destroyers, and those who purchased the latter books will know what to expect. In determining the focus and structure of the book the author has made a number of important decisions. The starting point for his descriptions of the development of each of the ships covered is the material held in the various British archives: Admiralty reports, Ships’ Covers and Constructors’ Workbooks. The line drawings are uniformly of a very high standard and although the photographs are excellent the inclusion of images taken later in the ship’s career tends to interrupt the design narrative. However, many readers will find this a strength, and there is no doubting the depth of Dr Friedman’s research. The quantity (and quality) of the illustrations is particularly impressive, and the production values of the book are everything one has come to expect from the pubisher. This is a sumptuous volume, providing a most authoritative and comprehensive review of British cruisers in the twentieth century. The book is beautifully laid out to Seaforth's traditional high standard. An excellent book which is a must for all naval experts, historians and enthusiasts. Most highly recommended. Provides an excellent overview of naval policy. This is a book for the specialist ship enthusiast or serious naval historian, and its worth having. This is a sumptuous volume, providing a most authoritative and comprehensive review of British cruisers in the twentieth century"
The book is beautifully laid out to Seaforth's traditional high standard"
An excellent book, which is a must for all naval experts, historians and enthusiasts. Most highly recommended"
...This book provides an authoritative account of British cruisers during the inter-war years and charts the enormous impact radio had on the design and operations of British Cruisers..."
...With extensive appendices on ship data, illustrated in depth with photos and finely detailed plans, this work matches the high standards set my Mr Friedman's earlier books on British Destroyers.. The book also contains a full list of ships discussed and their individual features and capabilities." ...Norman Friedman is an internationally renowned military analyst and naval historian." ...Naval historians at all levels should not miss the opportunity to add a copy of his work to their libraries. It is a first class read and highly commended." During the first 60 years of the twentieth century the United Kingdom possessed the worlds larest merchant fleet and a large number of overseas territories. 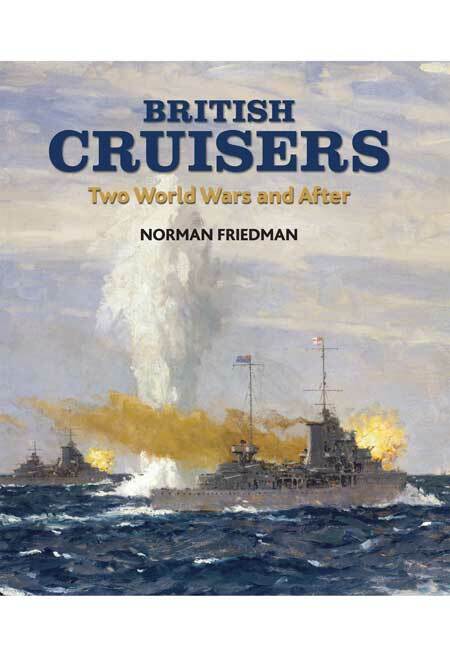 In this magnificent book, Norman Friedman explores fully the policy background to give a new insight into British cruiser development from 1907 onwards. The book, which is well written and highly informative, is likely to be seen as the definitive work on this subject and is good value for money. Very highly recommended. A very valuable volume for anyone interested in the history and development of the warships of the 20th century. British History has been steeped in the naval ever since Britain became the most formidable power at sea during the twentieth century and British Cruisers doesn't look like changing that pattern. Britain may have commanded the biggest merchant fleet but as Norman Friedman explains, it was the cruiser Britain believed was needed to cement their position of power. The book through a vast array of beautiful pictures combined with detailed text illustrates the development and launching of British Cruisers designed to police the empire and protect trade routes and describes everything from the invention of the heavy cruiser to the 6in-armed ship. Norman Friedman through his experience on writing both British and American naval texts opens up a world to a side of British History almost forgotten and ultimately highlights it's brilliance. The origin, design, role and usage of the Cruiser by the Royal Navy from the beginning of the 20th Century, is surely one of the most complicated, interesting, frustrating and exciting stories to be told. No ship other than the Cruiser in service with the Royal Navy encapsulates its reason for its existence and the role it played in protecting the British Empire and its trade in distant waters, whilst providing some heavy metal and protection nearer to home. With the demise of the Empire in latter halve of the century, the demise of the Cruiser within the Royal Navy is also mirrored in detail. Norman Friedman is without doubt one of the most pre-eminent Naval historians of all time, and as such itâ€™s become difficult, if nigh impossible to be critical of his work. This latest work will stand along side his other works in his pantheon of historical/topical and modern naval tomes. The book is broken down into some 11 Chapters that allow the reader to easily follow the evolution of the Cruiser in the Royal Navy. Not surprisingly the Chapters dealing with the machinations, implications and consequences of the various inter-war treaties and agreements, plus the political and financial straight-jackets are the most detailed in terms of there individual and cumulative affects on British Cruiser design. Friedman does pay attention to how other countries designed there cruisers, but he thankfully doesnâ€™t go down the comparative and often facile road of comparisons between various nations designs. All nations had various similar but equally unique requirements, which helped or hindered there design requirements. The use/service of the various Cruisers during war is an obvious area that is covered but perhaps not in the detail or scope one would expect. The coverage is based around the various modifications and design changes/improvements that came about through experience or technological advancement. This book isnâ€™t a book that will give you the detailed history of a specific vessels wartime service, for that there are specific titles you should look too. The post war role of the cruiser and its continued evolution is also covered as the age of the missile comes to the fore, at the expense of the gun! Finally we end up at the Command Cruiser passing its mantle onto the Invincible class â€˜through deck Cruiserâ€™ or light carrier. The book is completed by a single Appendix dealing with Fast Minelayers, which came about after several WW1 Cruisers were converted, many seeing active service through till the end of WW2 and beyond. The following Notes section contains yet more information, much of which would out do other books about British Cruisers by itself, in terms of its accuracy and detail. The usual Bibliography is there plus a very useful and handy Data List of various specifications of the numerous Cruiser designs used and proposed. The final segment gives us a Ships List with build, completion dates and ultimate fate of the vessels concerned. The book is lavishly filled throughout with numerous B/W photographs, and the usual excellent line drawings & plans by A D Baker III and others. For anyone truly interested in the Royal Navy and the Cruiser as an entity, then this book has a quality and gravitas that demands yet even more shelf space from you-Donâ€™t resist-Buy!